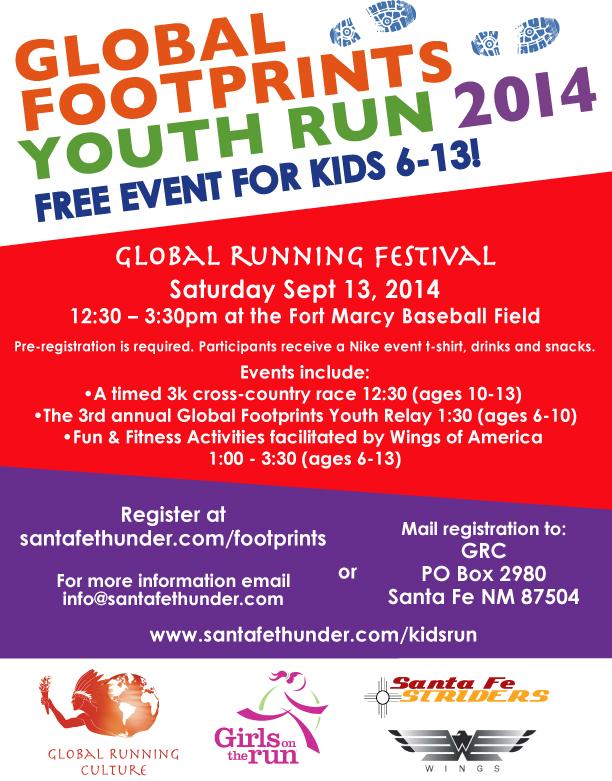 As part of the 4th running of the Santa Fe Thunder Half Marathon, Global Running Culture invites your child, age 6-13, to participate in the FREE Global Footprints Youth Runs! The kids’ events will be held during the Global Running Festival, where 1,000+ runners from over 30 states will be picking up their race packets and enjoying world music, international arts & crafts and cheering on the young runners! Nike event T-shirt, healthy snacks and drinks, a custom slap bracelet and the opportunity to meet world class runners from Kenya and other parts of the world! Sign up early – space is limited and these events will fill up! Global Running Culture is a 100% volunteer non-profit organization whose mission is to better the lives of youth through the powers of sport and education. GRC carries out programs in 3 communities where running remains a vital part of the local culture – Matugent, Kenya, Cusarare, Copper Canyon Mexico and northern New Mexico. For more information about Global Running Culture, please visit www.globalrunningculture.org. GRC, Girls on the Run, the Santa Fe Striders and Wings of America present the Global Footprints Youth Runs to further our mutual goals of encouraging active lifestyles for our children. 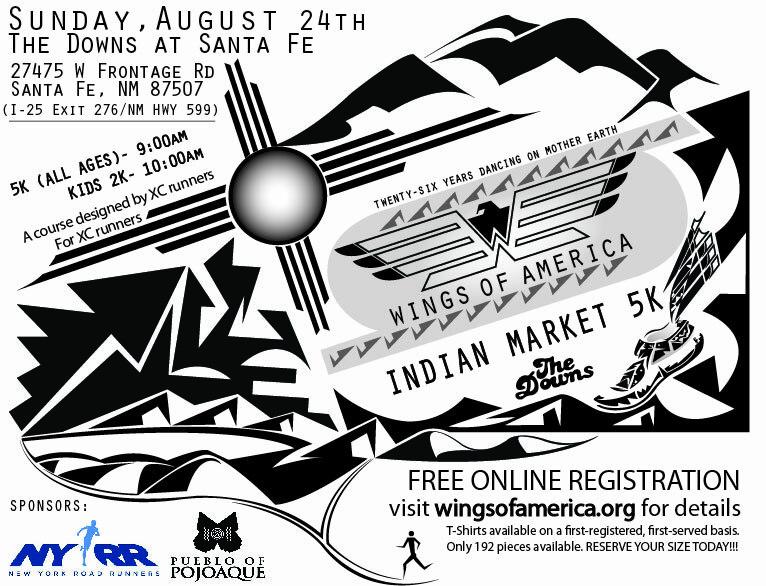 Hosted by The Pueblo of Pojoaque at The Downs at Santa Fe and co-sponsored by the New York Road Runners Foundation, Wings was proud to provide a quality 5K and kid’s 2K the sunday after Indian Market FREE OF CHARGE. Though many registrants ultimately chose not to show up to claim their bib on race day, we are proud of the 206 competitors (173 in the 5K, 33 in the youth 2K) that showed up to run! We hope those of you that competed had a wonderful time and that you’ll join us for future Indian Market 5K’s for years to come. Thanks once again to all the volunteers that helped register participants, mark the course, print shirts, prepare bibs, hand out shirts and monitor the course. We could not have done it without you! Also, a huge shootout to The Pueblo of Pojoaque and the New Your Road Runners Foundation for providing the venue and funds that enabled us to put on a free family event. Additional Pictures can be found in our album “Indian Market 5K 2014” on our Facebook. The scene out from under the registration tent to runners preparing for the 5K. 5K competitors battle up one of the last hills before making it to the long grass flats at the end. Competitors in the kids 2K warm up as a group before their race. 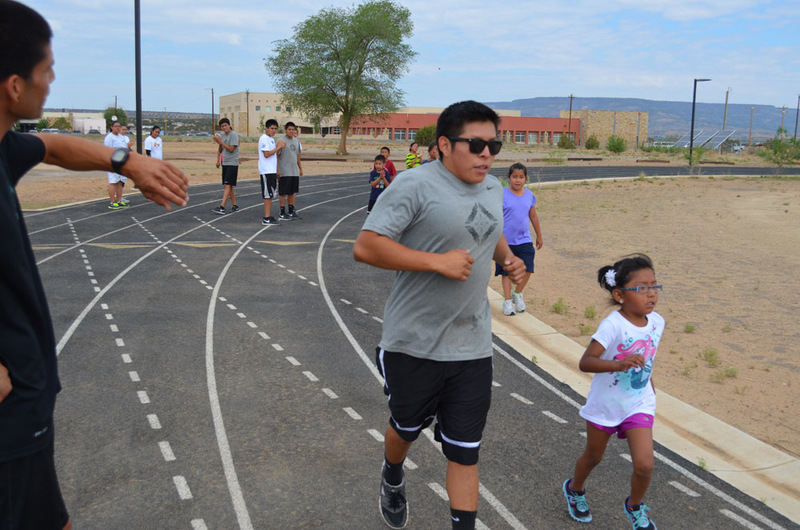 Wings summer facilitator and 2014 Indian Market 5K winner, Andy Yazzie, trots alongside Wings summer R&F Camp participant and Kids 2K winner, Brian Madalena (age 6), as he high gears past the first kilometer mark. Wings founder and Board Chair congratulates the women’s 4th place overall finisher, Kathryn Becker, on a job well done. 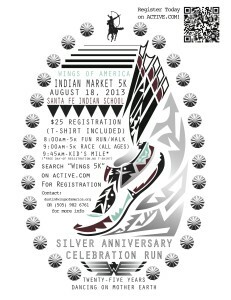 FREE registration is now available for the annual “Indian Market 5K”. 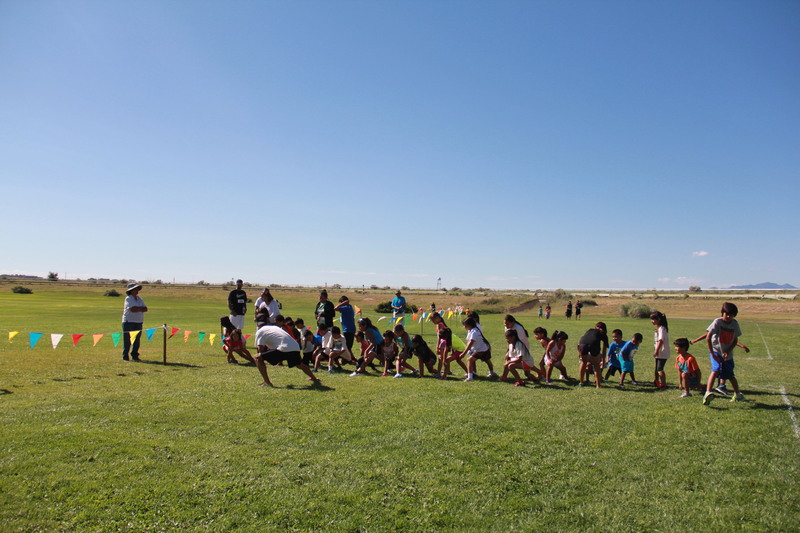 This event will celebrate another successful summer of Running & Fitness Camps and the organization’s 26th anniversary of promoting health and wellness amongst youth in Indian Country. FREE race t-shirts will be dispersed on a first registered, first-served basis. Quantities are limited to 192 pieces, adult and youth sizes combined. Peep at the official 2014 Wings 5K race shirt! We are excited to host the event at The Downs of Santa Fe for the first time. The move will give participants the opportunity to run a true cross country course complete with rolling grass hills and some quality dirt path. Perhaps even a few competitors will spike up? Expect to see hay bales on the course too! Aside from the 5K, we will run a 2K on the in-field for our up-and-coming track stars ages 4-11. Registration includes a race t-shirt (see graphics below) and refreshments after the run. Parking in a dirt lot at the track is FREE. All participants will be required to walk to the center of the track to start the race via the tunnel beneath the south turn. Port-a-potties will be the only restroom facilities available. Water and post-race refreshments will be available for all registered participants. 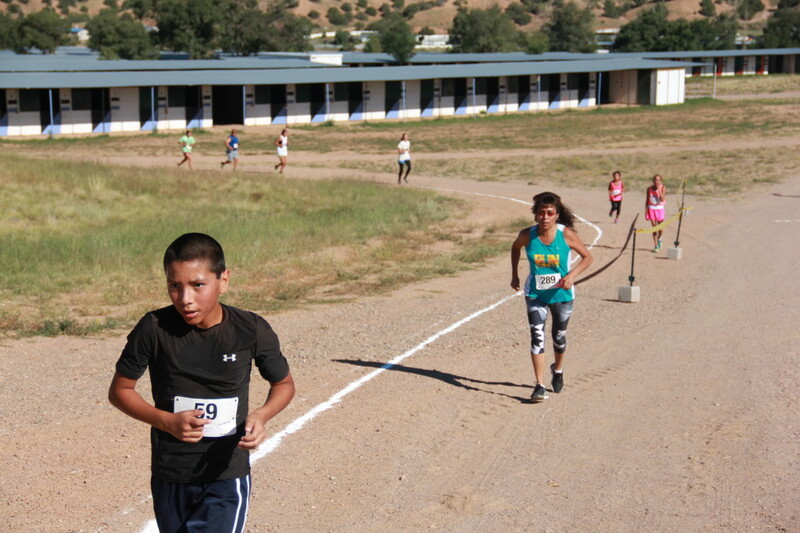 This past Saturday, May 24th, Wings of America took a team to Lower Old Oraibi to run the Hakintonmuya Relays. 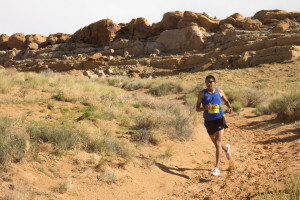 Organized by Juwan Nuvayokva of “Run Hopi”, this unique race challenges participants with some of the sandiest and steepest terrain on the Hopi Reservation. Each team entered is co-ed. This years Wings’ team was made up of Binahnii Curley, Daangoina Haven, Nikesha Eagleman and Dion John. As the team arrived early at 6am on Saturday morning, the weather was cool after the rain of the previous days, which had left the air beautifully clear for each runners’ 4 mile leg of the 16 mile relay. This helped with the initial challenging sand hill that runners face on the relay course! All four runners ran a successful race, with the team coming in first place overall for the relays. 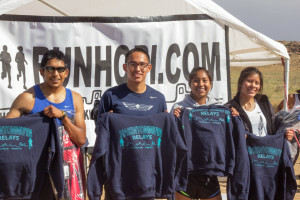 They were each awarded prizes of Run Hopi sweatshirts and Nike duffle bags. Winners in other categories earned other Nike apparel provided by Wings. Congratulations B, Dion, Daan, Nikesha and everyone else who competed last Saturday! 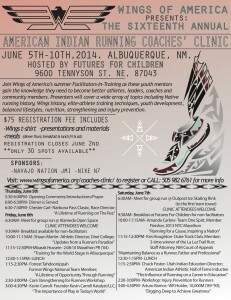 Wings of America is gearing up for its Sixteenth Annual American Indian Running Coaches’ Clinic! 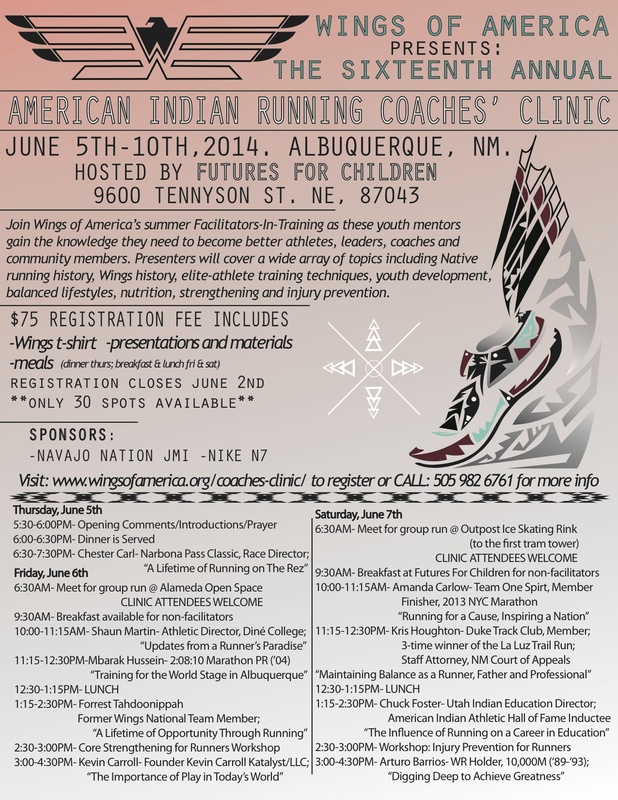 The 2014 Coaches’ Clinic will held in Albuquerque, NM, from June 5th – 7th and will be hosted by Futures for Children. Join Wings of America’s summer Facilitators-In-Training as these youth mentors gain the knowledge they need to become better athletes, leaders, coaches and community members. Presenters include, among others: Chester Carl, (Narbona Pass Classic Race Director) “A Lifetime Running on the Rez”; Shaun Martin, (Athletic Director, Diné College) “Updates from a Runner’s Paradise”; Chuck Foster, (Utah Indian Education Director, American Indian Athletic Hall of Fame Inductee) “The Influence of Running on a Career in Education”; and Arturo Barrios, WR Holder, 10,000M (’89-’93) “Digging Deep to Achieve Greatness”. 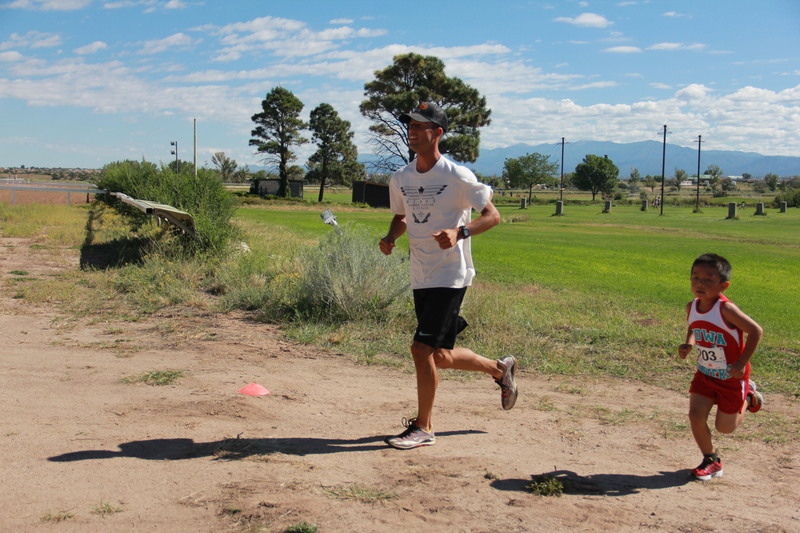 Clinic attendees will gain new perspectives on the history of Native Running and learn ways to take their passion to the next level. Registration is $75, and includes a Wings t-shirt, presentations and materials and meals (dinner Thursday; breakfast & lunch Friday and Saturday). There are only 30 spots available, and Registration closes June 2nd, so make sure to register now by clicking here, or by calling (505)-982-6761. 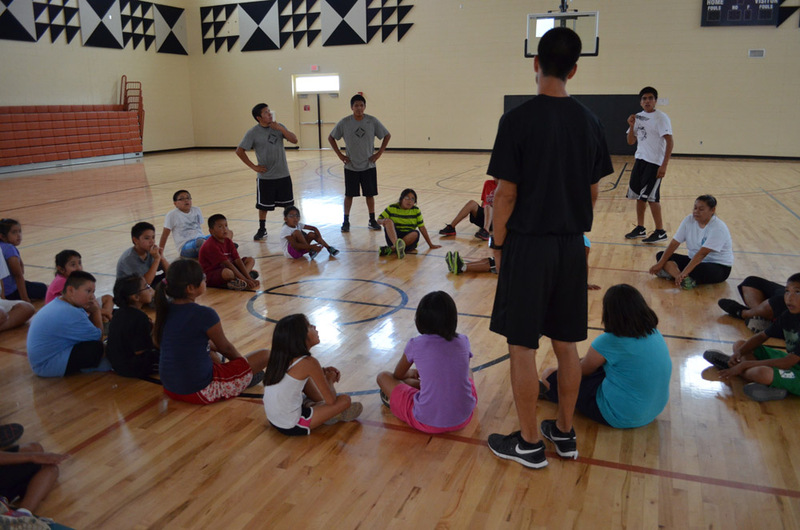 The Sixteenth Annual American Indian Running Coaches’ Clinic is hosted by Futures for Children and sponsored by the Navajo Nation JMI, and Nike N7. Sampson Sage of Piedra Vista High School (Farmington, NM) and Laverne Lomakema of Hopi Senior High have been named honorary coaches of the all-star squad. 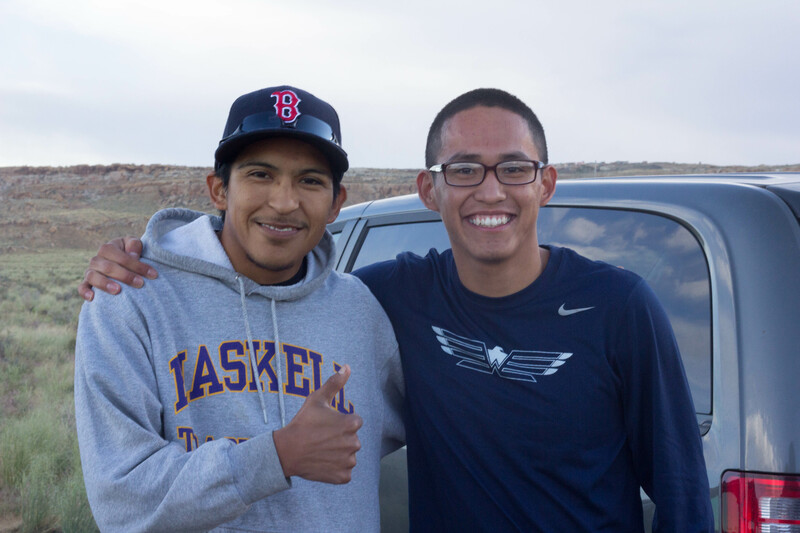 Both will travel with the team to Boulder to serve as mentors and advisors as Wings athletes prepare for the race. The organization will cover travel expenses and room and board for the fourteen young men and women selected to race in Wings uniforms. 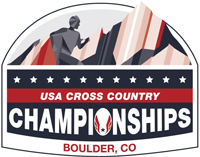 Aside from competing, the group will get the opportunity to absorb the culture of Boulder and the surrounding area through a number of site visits and activities planned and paid for by Wings. Wings created this opportunity in order to showcase the talents and positive achievements of American Indian youth and provide them with a cross-cultural learning experience. 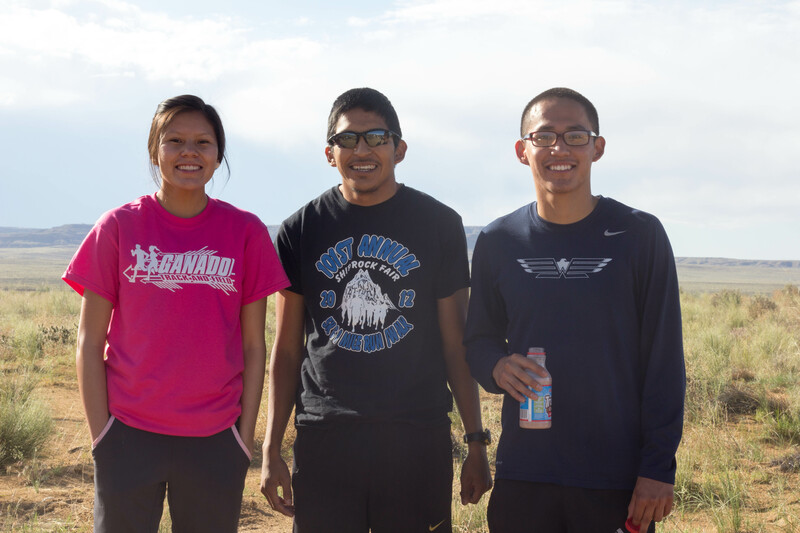 The program brings Native youth together from across the nation to compete as a team in an elite field of both high school and college runners. Many program alumni have earned the attention of college coaches with their performance in this race. 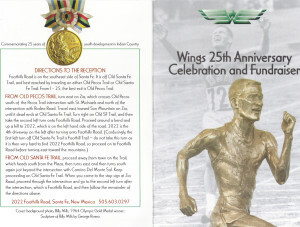 Wings runners have captured twenty four national junior team titles since 1988. Wings would once again like to thank The HB Oppenheimer Fund for its contribution to the organization to help fund recruitment and promotion efforts. 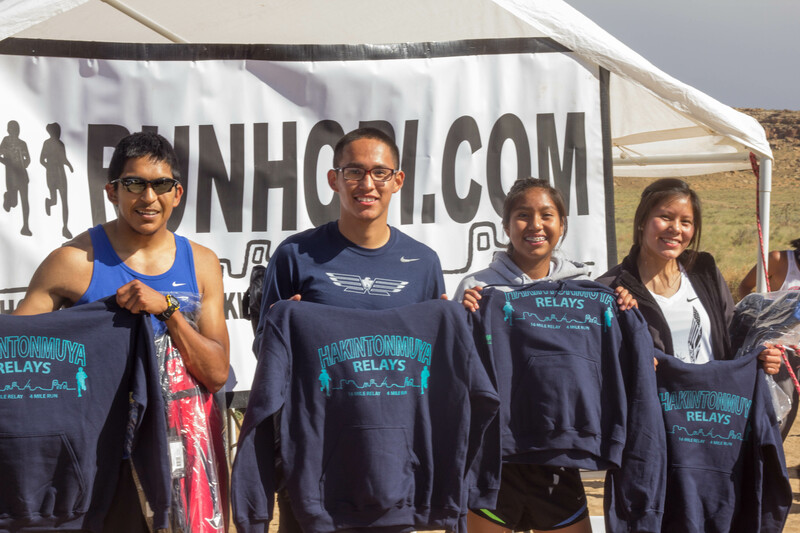 With stimulus from The Fund, Wings was able to assist nearly 40 student-athletes with race registrations, travel and lodging costs as they attended their regional qualifying races. 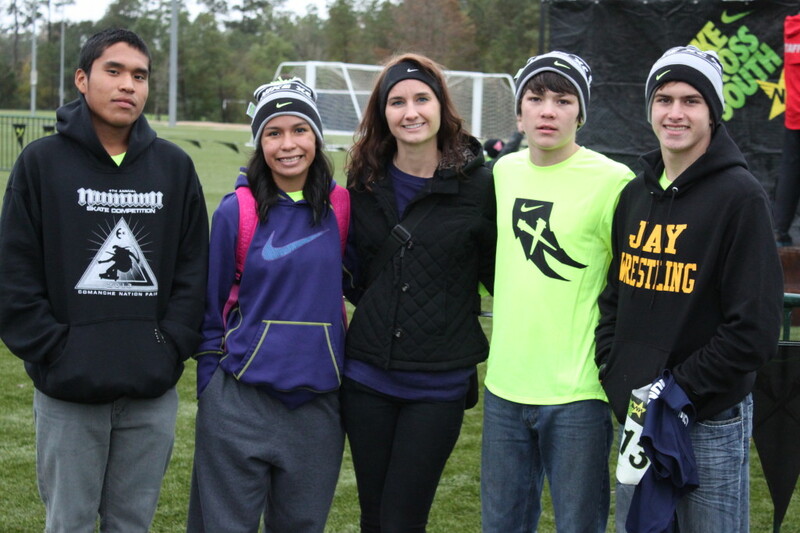 Wings athletes pose near the finish line of the NXN South championships on November 23rd in Woodlands, TX. 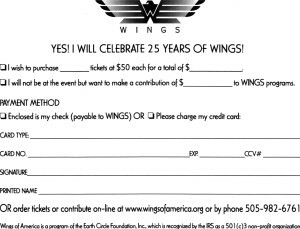 Wings of America 25th Anniversary Celebration – August 15, 2013 – 4:30 p.m.-7:30 p.m.
Wings of America will celebrate 25 years of service to Native youth in style with a fundraiser event in Santa Fe on Thursdsay, August 15, 2013 from 4:30 pm-7:30 p.m. 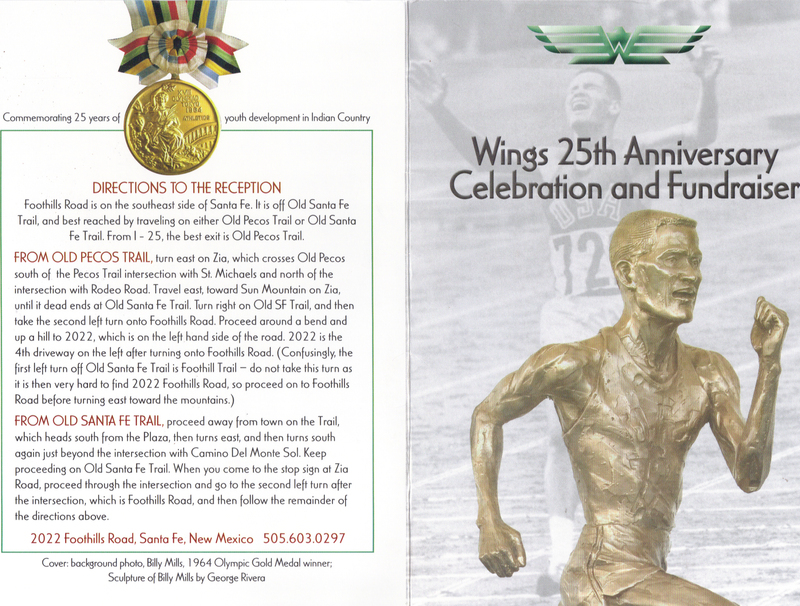 Hosted by board member Dr. Letitia Chambers, Wings will honor 1964 Olympic Gold Medalst, Billy Mills, and three founding members Will Channing, Andrew Hixon and Oren Lyons. 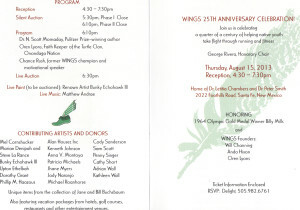 Plans include cocktail reception, silent auction (donors: Adrian Wall, Kathleen Wall, Penny Singer, Patricia Michaels, Phillip Haozous, Alan Houser, and so much more), live art auction by Bunky Echohawk, III, entertainment by Matthew Andrae and special guest Chance Rush. Tickets are $50 per person, all fundraising efforts will go towards more Running & Fitness camps on the Native reservations across our Country. You may contact Delight Talawepi at 505-982-6761 to reserve your spot in this once-in-a-lifetime celebration of serving Native youth since 1988. 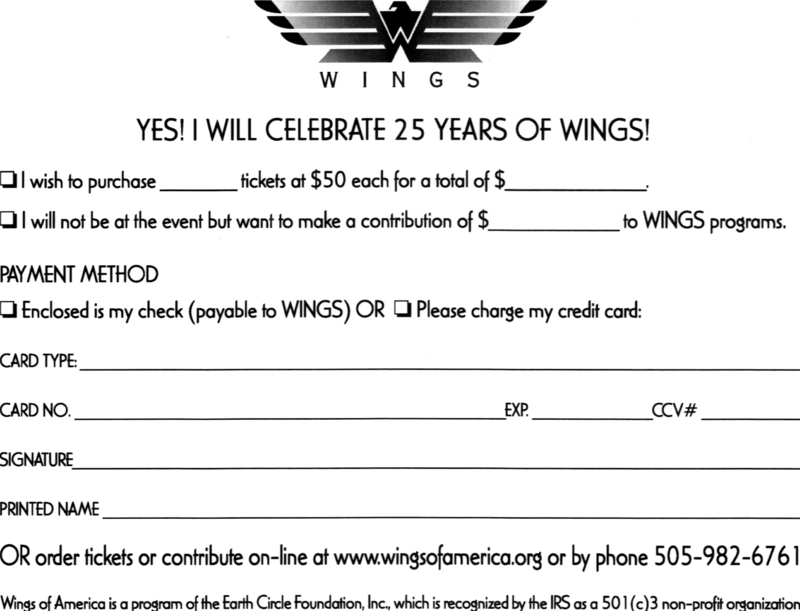 This is a fundraising effort, if you are unable to attend, PLEASE CONSIDER DONATING TO WINGS OF AMERICA WITH THE MISSION TO SERVE MORE NATIVE YOUTH AS WE CONTINUE TO “DANCE ON MOTHER EARTH”. To download a contribution card, click here: Reply Card. Let’s make history in the spirit of Popé! 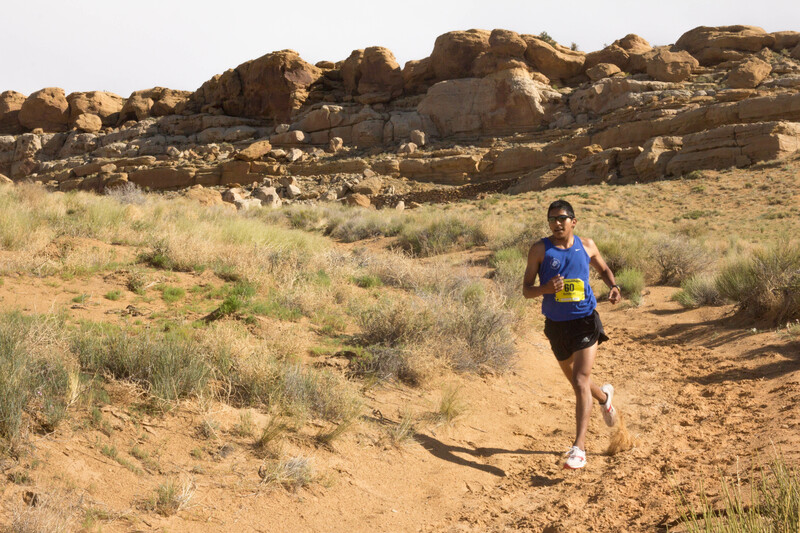 Your participation in the Resilience Run will support the The Indian Pueblo Cultural Center in reaching our goal of acquiring the Popé statue learn more. Post-Event Festivities include Native Dances, Food, Art, Music, FREE Admission to the Indian Pueblo Cultural Center and more! 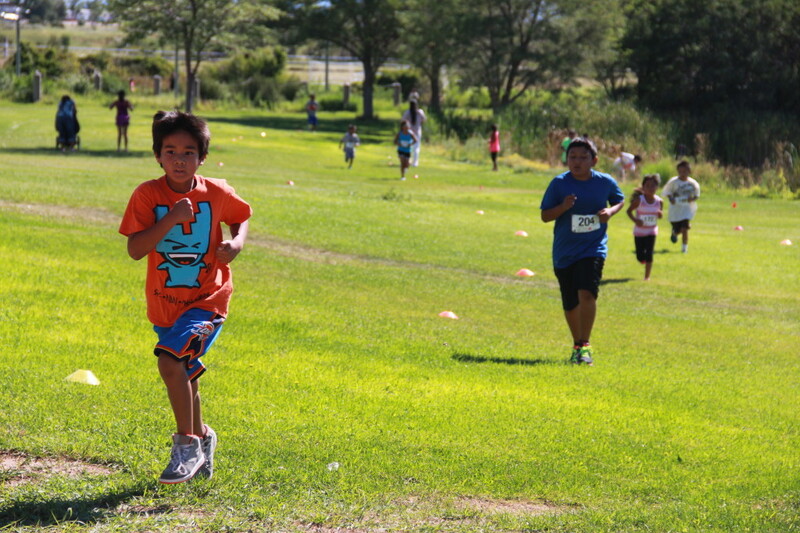 The first annual run will be held on August 10, 2013 at the Indian Pueblo Cultural Center (12th & I-40) map. Get all the race event, schedule, prices, and discount deadlines here. 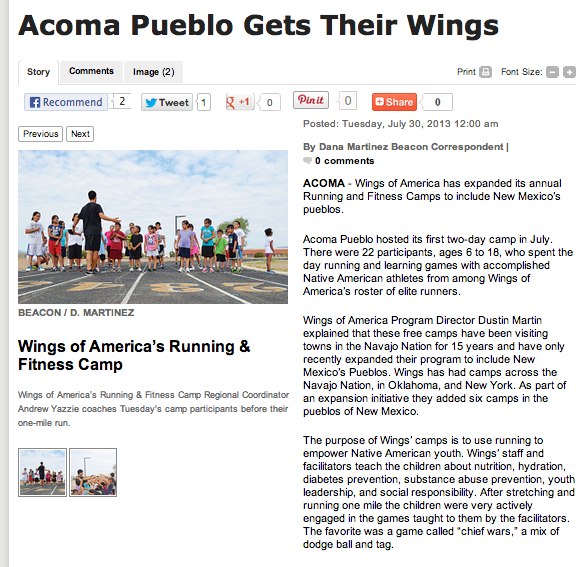 Thanks to Dana Martinez of the Cibola Beacon for taking the time to write a story about our two-day Running & Fitness Camp at Acoma a few weeks ago! Wings is proud to hear participants from multiple generations talk about the positive affects of running and our programs. Click HERE to read the article in full. Scroll down to see a few additional pictures from a great camp. Much appreciation to the Acoma Community Center and its staff for so graciously hosting our facilitators. We hope we get the privilege to do it again next year. 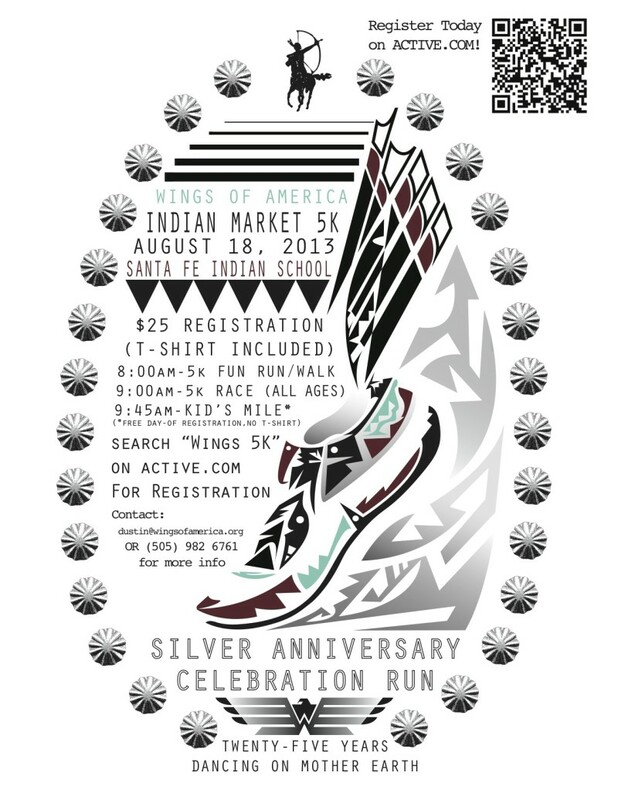 Join Wings on Sunday, August 18th, 2013 for our annual “Indian Market 5K”. 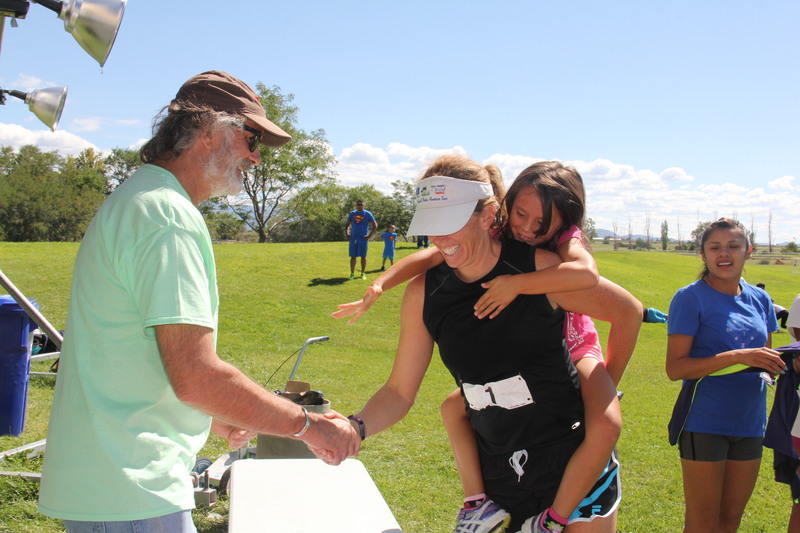 Bring the whole Family to walk, jog or run the 3-mile course set our over the Santa Fe Indian School grounds. 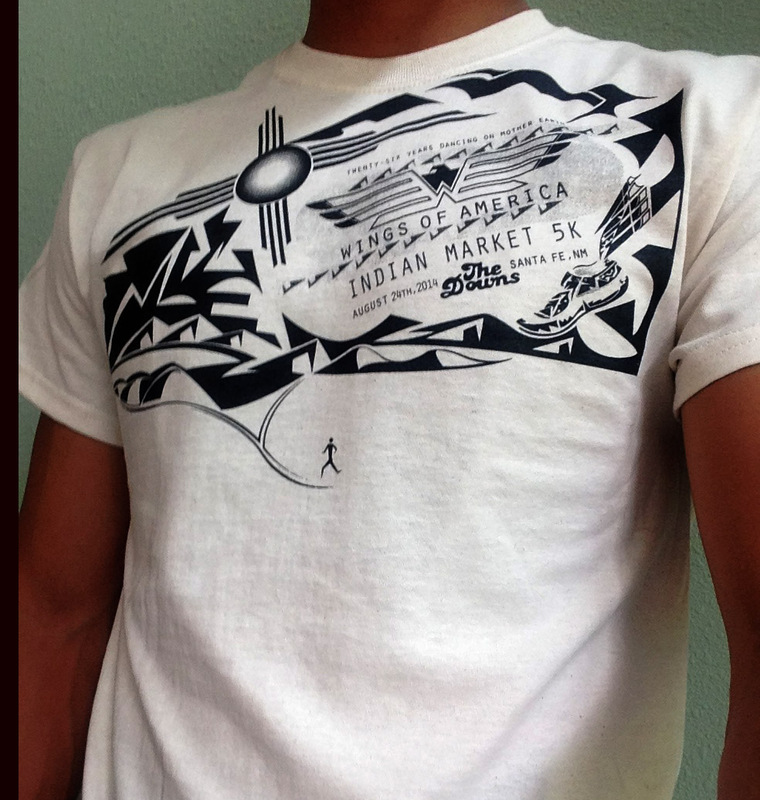 Registration is $25.00 and includes a limited edition t-shirt designed by Wings Program Director, Dustin Martin, and world-renowned Santa Fe artist, Tony Abeyta. 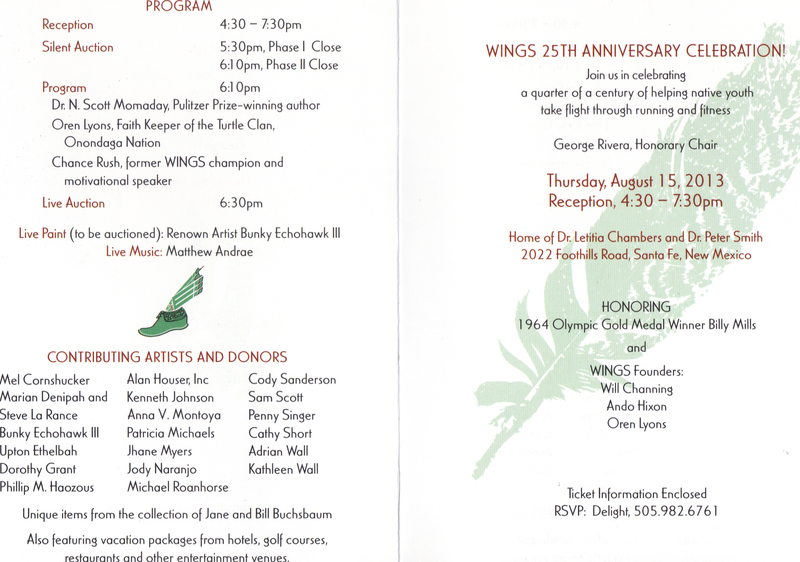 Join Wings in a fun-filled day of fellowship through exercise as WE CELEBRATE 25 YEARS OF POSITIVE YOUTH DEVELOPMENT IN INDIAN COUNTRY. Click HERE to visit the registration site.